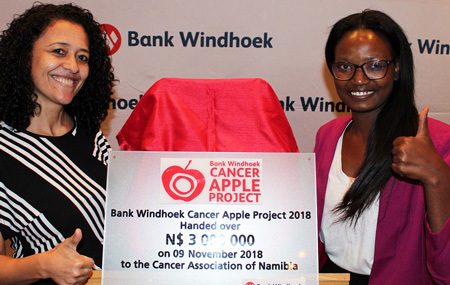 The Bank Windhoek Cancer Apple Project, which has impacted the lives of many this year managed to raise N$3 million in aid of the Cancer Association of Namibia (CAN). This was revealed at a handover function held on Friday in Windhoek. The Project taps into the charitable nature of ordinary people who are willing to buy an apple for N$5 and become a symbol of hope for those living with cancer. The collected funds amongst others, enables the CAN to reach out and screen people from all walks of life at no cost. Bank Windhoek’s Managing Director, Baronice Hans, said that the Bank is proud to partner with CAN, whose activities align with and support the services offered by the Ministry of Health and Social Services. “For the past three years a portion of the funds raised through the Cancer Apple Project has been channeled into financing an outreach programme, and since then 22 130 people have been screened for all types of cancer in all 14 regions of Namibia,” said Hans. The screenings are mainly for breast and cervical cancer which are most prevalent in Namibia. Hans added that in 2018 alone, 3438 women have been screened for cervical cancer through the Outreach Programme and of those, 223 resulted in early detection. This means that early detection through this project, has potentially saved 223 lives. The Entrepreneurial Challenge, introduced three years ago to increase the amount of money raised, was a success. Through this initiative, each Bank Windhoek branch and department receives seed capital of N$4500 that is then used to make a profit. This year the branch that generated the most profit in the three months allowed for this, was once again Omaruru Branch, who generated N$50, 582.13. The branch that sold the most apples this year, was the Swakopmund Branch who sold 52, 836 apples. A total of 603 schools participated in the Project in the respective categories and shared the prize money of N$45 000. Combined, the schools sold more than 350 000 apples. 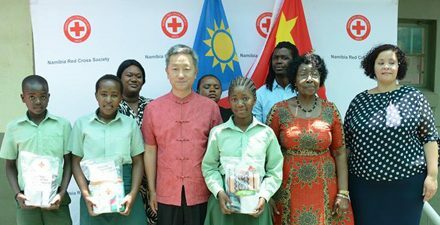 Each winning school received a cash prize of N$7 000, while second and third place received N$5 000 and N$3 000 respectively. The prizes were given in the categories of Pre-Primary, Primary, Secondary and Combined Schools. CAN’s Chief Executive Officer, Rolf Hansen, thanked Bank Windhoek, its staff members and customers, the Ministry of Education and everyone who has helped with raising the funds for the Bank Windhoek Cancer Apple Project. 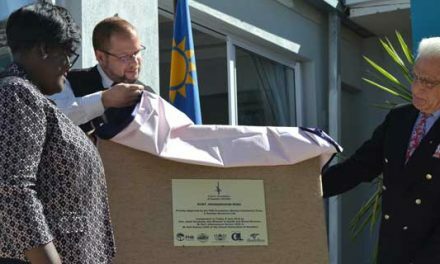 “I express the gratitude of not only the Cancer Association of Namibia, but I also express gratitude on behalf of every patient who has been touched by the greatness of this project,” said Hansen. Established 18 years ago, with the aim of creating cancer awareness and educating Namibians to protect themselves against the disease, the Bank Windhoek Cancer Apple Project has grown into one of the biggest Corporate Social Responsibility ventures and has raised in excess of N$20 million since its inception. Caption: CAN’s beneficiaries and cancer survivors, Janene Eiman and Reginalda Muronga, were also at the funds handover function and said that the raised amount is a sign of hope.